Speed, sensitivity and dynamic range will enable multichannel atomic-scale imaging and analysis of material properties such as electric and magnetic fields. This development is being supported by the CCMR and the Kavli Institute at Cornell. For further information, see this poster [link to PDF of poster] and the FEI announcement below (link to https://www. fei.com/news/FEI-and-Cornell-University-Collaborate-to-Commercialize-New-EMPAD-Detector/). Hillsboro, Ore. and Ithaca, NY/July 25, 2016 – FEI and Cornell University have entered an agreement to commercialize a new high dynamic range detector for FEI’s electron microscopes. It promises to enable new kinds of multichannel imaging and analysis that have not been possible previously. FEI expects to complete the commercialization of the design and offer the detector for new and retrofitted electron microscopes in 2017. Uniquely, the electron microscope pixel array detector (EMPAD) simultaneously captures the spatially and angularly-resolved distribution of all transmitted electrons, allowing researchers to acquire and post-process a complete data array of scattering information to generate images and analytical results in scanning transmission electron microscope (STEM) applications. 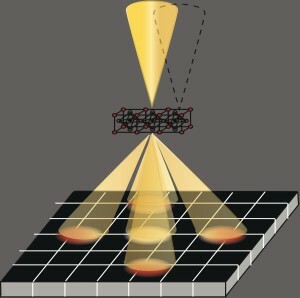 Atomic resolution image contrast enhancement methods, such as iDPC, electric and magnetic field visualizations, and strain measurement techniques, will benefit from the unmatched performance of the new detector.